A few things happened to Manila Groove since I visited last. First, about three months ago, Gustavo Arellano tipped readers about the little-known Tustin eatery and its constantly updated website menu in his This-Hole-in-the-Wall-Life column. Second, they've expanded by taking over the store next door, effectively doubling the space with new tables and chairs. And when I say "new", I mean it -- the place was nothing more than a take-out counter before. Now, there's framed art, posters, and hanging plants. Though, sadly, no big wooden spoon and fork. The third, and perhaps most awesome development, is that as of January, their Filipino breakfasts ($5.99 with a free can of soda or coffee) are cooked up all day long from 7:30 in the morning to 9 at night! Now, traditional silogs -- the gut-busting, cholesterol-spiked meals of fried rice, eggs, and Filipino breakfast meats -- can also be had for dinner. No longer will your craving for longanisa and eggs be encumbered by what time you wake up. And let's face it, the last thing you want to do when you get out of bed hungry is to cook longanisa yourself. The sausage is notoriously time-consuming and messy to fry. Instead, just mosey into Manila Groove (in your pajamas if necessary) where the plump, fatty, juicy, shiny, porky links will be waiting. Three come to a meal, which, because of their size (I'll spare you the obvious jokes), is somewhat overkill. Two fresh eggs are cooked over-easy and plopped over yellow rice into which the yolk will eventually burst and bleed. Diced tomatoes and liberal squirts of Datu Puti vinegar are required side items -- the antidotes to the overwhelming doses of protein and fat. But it's not just about the longanisa. Manila Groove's silog's include other worthy meats like tapa -- the unholy union of beef jerky and a Jelly-Belly jelly bean. It's as black as licorice, dense, crumbly, chewy, swimming in grease, and so sugary it'll put you that much closer to diabetes. Healthier-minded folks should opt for the baby bangus instead. In it you will get a fried fish, splayed open, head intact, skin attached, with a flaky flesh that has the yummy tang of yogurt. Balk if you must that fish is served for breakfast. But who are you kidding? By the time you'll get to Manila Groove, it'll be well past noon...and you still wouldn't have taken a shower. mmmm...Bangus! I've lived in Tustin for 7 years. 7 YEARS! I've searched for a filipino restaurant in the area since the day I moved here. Have I been blind this whole time? Obvious answer...YES! I must have been, because I go to the gym in that complex. I've had yumminess from Cream Pan. I've even had several drinks at DEVA's. I think I am officially nuts! How could I have missed Manila Groove? Oh well. Longsilog here I come! Thank you ELMOMONSTER! I love me some bangus! That's what I would have. 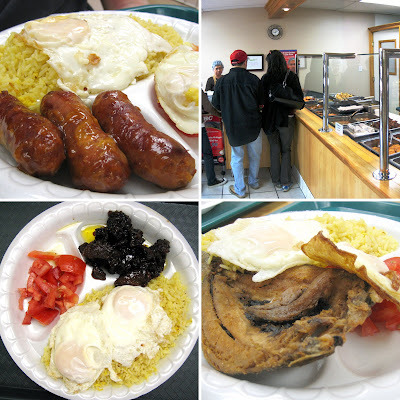 I miss the plentiful Filipino restaurants in Illinois. None to be found here. I only had fish tacos at in Tustin, but it seems there are lots of good places to eat there. Oh. So far I've been good about updating the food blog weekly. I'd like your opinion, since I am new to food blogging. Thanks. wow! i want some daing na bangus or any meal with bangus right now....sinigang, relleno, paksiw, etc, etc. WoW that looks like alot of food. My kinda joint. All-day silog?!!! That more than makes up for the absence of wooden trinkets on their walls. Bangus (and it's Indonesian translation, bandeng) really needs to be more popular here. It's really just about the most delicious fish ever! Ah, the beauty of bangus...it goes with everything! And at every meal! You won't need to eat another meal that day once you down a silog from Manila Groove. I guarantee! Totally makes up! Also, there's banana ketchup in bottles, Moneygrams, and phone cards. Now THAT'S authentic! Elmo got is Manila Groove on! Do they have sisig - the kind made with pig head? 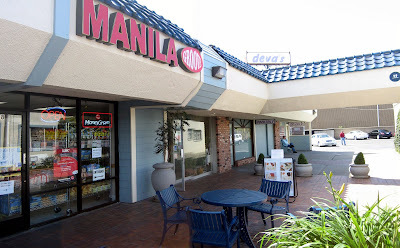 When we lived in Tustin, right down the street from this place, we never stopped by Manila Groove. It was always one of those places that was on "the list" but never carried through. We'll be up in Tustin again at the end of this week. Thanks for the reminder. I have been going to Pinoy Pinoy in Cerritos. I thought the restaurant is clean and good for the price. I would be so all over it if they had sisig! I'm not sure where you're located now, but if you're supply of homecooked Pinoy food runs dry, get thee to Magic Wok in Artesia. Possibly the best in America. And their sisig will make you cry! I've come close to trying Pinoy Pinay, but it's right next to Red Ribbon and Chowking...and by the time I get out of there, I'm stuffed. Buy hey, you're in New York! Surely there are some Flips around to cook you a proper silog! Spare us the jokes? Now why would you do that? That's just me; classy! ......Puahahaha! Dang, I knew I couldn't say that with a straight face. if you really want filipino home cooking, this not the place for you. I went straight to Manila Groove as soon as I read this article and I was not impressed at all. The longanisa was half cook, the fried rice is like burned rice crispies with oil, the eggs are burned on the outside edges. I said to myself.... hmmmm.... let me try some of the other dishes that they have... so I had the calderata and dinugguan to go... to my dismay... it was like eating beef rubber with tomato sauce... as with the dinuguan... it is still in the box while i try to build up my courage to eat it. service is not as good also... i think they are counting the meat that they put on those to go boxes. its like 5 pieces of meat per box unlike those chinese to go restaurants where they fill the box all the way to the top. prices are not reasonable at all. Staff are typical filipino's that would not smile at all unless you are a different race. I would recommend you to go to Hong Kong express instead where in your $10 would feed the whole barrio. Thanks for the article. Note: these guys are closed on Sundays. Wow! That bad eh? Did I just get them on a good day or what? Truth be told, I went to Manila Groove middle of last year before they made these changes and the lunch I had was...meh...but I was honestly impressed with the breakfast I wrote about in this post (I usually avoid writing about places I don't like). Let your comment be a warning to everyone that your mileage will vary. O YEAH I LOOOOOOVVVEEE this spot. ANG SARAP!!!! Maybe im a little bias because im Filipino, and have no family in social but I have taken my non Filipino friends here and they loved it too. Basically its a hole in the wall place in the corner of a plaza next to a bar lol. Ive been here a few times so far and when I do I have a feast.